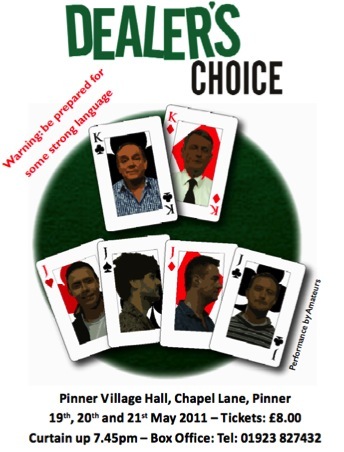 "Dealer’s Choice was first performed at the Royal National Theatre in 1995 where it won both the 1995 Evening Standard Award for Best Comedy and the Writers’ Guild Award for Best West End Play. The play is set in a restaurant and focuses on the regular Sunday night poker game played after work. The all male cast battle over the poker table to establish who are the winners and losers whilst delivering rapid fire banter to hilarious and moving results. This play was staged on the floor of the hall with the audience raised to look down on the action. This was a first for the Pinner Players and provided the audience with an intimate theatrical experience." "I have risen from the ashes like the proverbial dodo. I am resurrected, it took the Lord three days, the Mug one hand ..."